Should You Buy This New Dividend ETN? 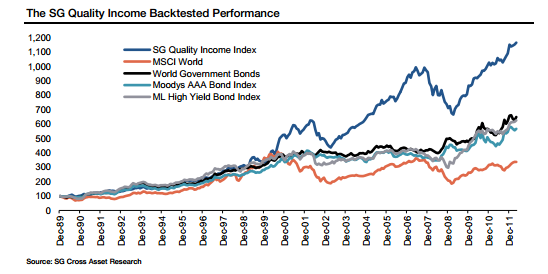 Earlier this week, a friend recommended I take a look at this excellent post by Interactive Investor (UK) writer Richard Beddard that highlighted a recently launched dividend strategy from SocGen called the "SG Quality Income Index". I've picked up from various other sites that the SGQI index also focuses on dividend sustainability and balance sheet strength while giving less value to traditional dividend cover metrics ("Our research suggests that good dividend cover is not a good indicator of how safe that dividend is in the future"). So is the SGQI the perfect methodology for approaching dividend investing? From what I've read thus far, I agree with some points and others I have remain skeptical about. There's nothing revolutionary about SGQI's findings, as there are myriad studies supporting dividend-paying stocks (as a group) outperforming the market. Here are two practical reasons why I believe these studies have merit. First, dividend payouts are "sticky" -- once they're started they're difficult to reduce or eliminate -- so management has to consider those regular cash outflows when making capital allocation decisions. A management team flush with cash is like the proverbial man with a hammer and they are prone to "empire building" through a rash of acquisitions. After all, it's in their best interest -- the bigger the company becomes the more they can demand from a pay perspective. Sadly, acquisitions (especially large ones) typically benefit the shareholders of the acquired company and not those of the acquirer. Having a regular dividend cash outflow, therefore, reduces the pile of cash at management's disposal and reduces the odds that management will invest in acquisitions that destroy shareholder value. Second, a company that pays a regular and (ideally) an increasing dividend is more likely to be confident in the longer-term prospects for the company. By regularly increasing the dividend, management is indicating that it believes it will be able to afford that payout in the future. In addition, paying a regular dividend allows shareholders to immediately share in the company's success and realize cash flows alongside the company. Non-dividend paying companies, on the other hand, retain all cash flows to reinvest in the business and are thus implying that they can earn a higher rate of return on your cash than you could if they handed it back to you. There are some rare cases (think Apple under Steve Jobs) where that's reasonable and desirable, but it's not common for companies to be able to consistently reinvest all their cash at rates above their cost of capital. Rapidly deteriorating balance sheet health was one of the major reasons that companies cut their dividends during the financial crisis. Indeed, 2007 set M&A records and a good number of companies overextended themselves with acquisitions thinking the good times would continue. When the financial crisis hit, these companies were often in danger of breaking their debt covenants, risked credit rating downgrades, or struggled to refinance near-maturity debt. As a result, dividend payouts were naturally cut in an effort to shore up cash and repair balance sheet strength. To reduce the risk of balance sheet-induced dividend cuts, I look at a company's interest coverage (EBIT/interest expense) track record and want to see at least 3x cover on a consistent basis. Another good rule-of-thumb is to avoid companies with net debt-to-EBITDA ratios above 2x. Unless that company has sustainable competitive advantages and stable margins, an economic downturn could quickly call its dividend into question. SG stresses that quality income payers must have both a robust balance sheet and robust underlying business economics. Indeed, it is critical to have both. A firm with a solid balance sheet, but deteriorating business fundamentals won't likely make for a great investment. Eastman Kodak, for instance, had a pretty solid balance sheet in the late 1990s, but its business economics were beginning to deteriorate as digital photography stole share from Kodak film. That's why it's critical to frequently assess the strength of a company's competitve position -- are there new substitute products, new or strengthening competitors, a loss of an imporant patent, etc. that could impair the company's ability to generate strong returns? If the company's competitive position is deteriorating, it's probably best to pass on it as an investment even if it's currently in good financial health. 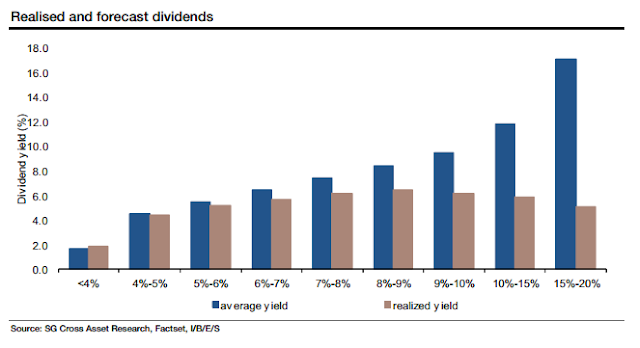 As I've said before, ultra-high dividend yields can mean ultra-high risk of a dividend cut. The market doesn't often give away low-risk 8%-plus yields, so it pays to be skeptical of any yield that seems too good to be true. I really liked this chart that SG put together that compares realized and forecast dividend yields and provides statistical support to the notion that the higher the initial yield, the more likely that yield is unsustainable. In The Future for Investors, Wharton professor Jeremy Siegel revealed the best performing U.S. stocks between 1957 and 2003. The best performing stock was tobacco giant Philip Morris (now Altria), which generated an incredible 19.75% annualized return over that period. Other top-performers on the list included Coca-Cola, Pfizer, Heinz, Unilever, and Wrigley. These companies may not have operated high-octane businesses, but they earned steady profits and had sustainable competitive advantages that helped them maintain pricing power over many decades. This translated into incredible returns for their long-term shareholders. Indeed, in Peter Lynch's classic One Up on Wall Street, he lists thirteen signs of an attactive stock. Among them are several recommendations to look for "boring" stocks, including: It sounds dull - or, even better, ridiculous; It does something dull; It does something disagreeable; There's something depressing about it; and It's a no-growth industry. Boring, high-quality stocks are attractive long-term investments precisely because they aren't going to grab a lot of investor attention and are thus more likely to be undervalued. Who wants to brag to their friends that they picked up 1,000 shares of a company that makes cleaning products? It's much more fun to talk about the stocks du jour -- the Facebooks of the world. Financial headlines love a good high-growth story and you won't see the FT flashing a story about a company that's raised its dividend for 10 years in a row, but the latter are exactly the types of companies you should look to own as they have been creating real long-term shareholder value. The SGQI backtest reminded me of the backtests done by WisdomTree when it was launching its line of dividend-weighted ETFs. As I wrote in 2009, WisdomTree's dividend-weighted model supposedly would have worked great in the past, but struggled to produce the same results when the dividend landscape dramatically changed during the financial crisis amid the hundreds of dividend cuts between 2008 and 2009. Judging from the performance chart (the first one on this page), SG studied the period 1989-2011. 22 years is a decent amount of time, but the data population is relatively small (8,030 days) and subject to more error. SG's backtest also assumes no transaction costs or commissions -- both of these things (as well as taxes) are critical components to realized returns and can't be overlooked. Backtesting is a fine way to test a strategy or theory -- so I'm not critical of SG using a backtest -- but it's important to take backtests with a grain of salt as they are backward looking and investing is a forward-looking activity. Specialized or formula-based strategies that worked in the past may not work in the future. A lot has changed in the dividend world since 1970. 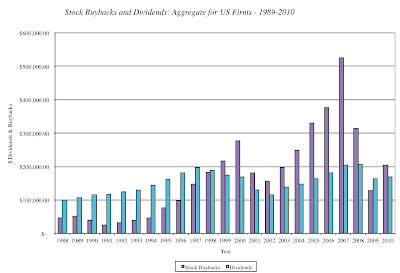 At the time, stock buybacks were essentially non-existent and cash dividends were the primary way of returning shareholder cash. Today, a lot of companies prefer buybacks to dividends for a number of reasons -- they aren't as sticky as dividends, they can artificially increase EPS, and can increase financial leverage. Recall that expected return is approximately equal to starting dividend yield + dividend growth +/- P/E re-rating. 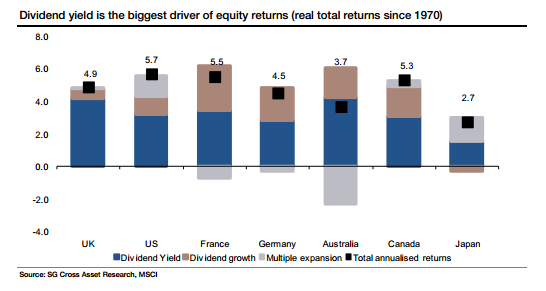 SG argues that dividend yield was the biggest component of equity returns between 1970 and 2011. That might be true and I don't have all the data they used to compile their chart (the second chart from the top), but using some annual data for the S&P 500 between 1960 and 2011, I put their findings to the test. 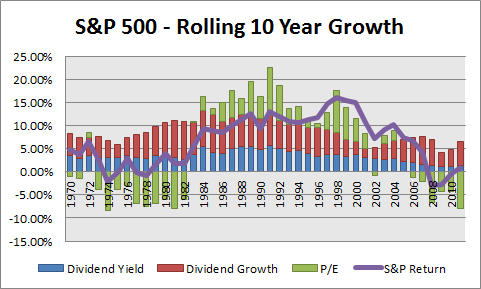 I took the starting dividend yields each year between 1960 and 2001 and measured the rolling 10-year annualized changes in dividend growth and P/E over the subsequent 10-year period. My (less scientific...hopefully) findings were a little different from SG's. The median dividend yield over this period was 3.4%, the rolling 10 year median dividend growth was 5.4%, and P/E contribution was 0.5%. My data seems to suggest that it's, in fact, dividend growth and not dividend yield that has been the primary driver of long-term equity returns. At least in the U.S. Moreover, average dividend yields were much higher in 1970 than today -- 3.46% in 1970 vs. 2.07% in 2011 -- so SG's results might be a function of the chosen starting year. 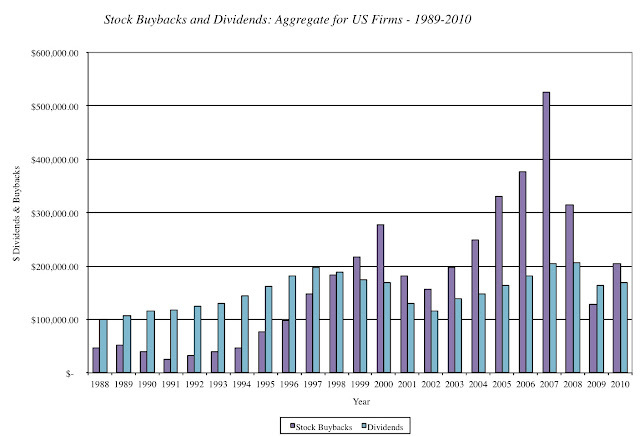 Thanks to the widespread use of buybacks as an alternative to dividends, I don't think we'll get back to consistent 3%-plus average dividend yields in the U.S., so I doubt that dividend yield will be the largest component of equity returns over the next 40 years. I do agree with SG that balance sheet health needs to be considered when evaluating the quality of a dividend-paying stock, but I would be interested to see the data behind their claim that dividend cover was not a good indicator of dividend sustainability. Intuitively it doesn't make sense. A company that consistently covers each dollar of dividend with $3 in free cash and earnings will likely pay a more sustainable dividend than one that covers each dollar with $1.20 in free cash and earnings. If they were using annual dividend cover data rather than normalized dividend cover data (a five year average), I can see why dividend cover metrics may be less explanatory. That's because in any given year highly cyclical companies may have great coverage metrics if the economy is strong, but the coverage can quickly deteriorate in a recessionary year. When you're measuring a company's dividend health, I recommend using at least five years of data (preferably more, if available) to see how dividend cover has changed over the years. For cyclical companies, use normalized figures to avoid the trap of misleading fundamentals in peak years. I wasn't at all surprised to hear that SG was launching an ETN that tracks the QI index. Fact is, with bond rates so low right now there's a ton of money flowing into dividend-focused ETFs and funds, and just like any industry that's receiving a lot of capital it naturally inspires innovation in the space. Looking back, some of those innovations will be helpful to investors while others won't. Therefore, it's important for investors to be skeptical of any new mouse-trap aimed at dividend investing today. In SG's advert for the QI ETN, they state: "quality income stocks can provide the bond-like characteristics of income and capital safety, but also offer scope for capital growth like equities." If that sounds too good to be true, that's because it is. With a stock (no matter how high quality it might be), your principal and dividends are at total risk, whereas with bonds there's a contractual obligation for the company to pay you back interest and principal on certain dates. What SG is actually describing in that sentence are convertible bonds that allow you to convert your bond into equity at a predetermined price if the stock price rises, but also offers downside protection in that you can simply hold the bond to maturity if the stock declines. While I think that income-minded investors with a long time horizon should consider a diversified dividend-portfolio in this low bond-rate environment (in the context of their individual risk tolerance, investment objectives, etc. ), it needs to be made clear that bonds and stocks have very different risk profiles. I applaud SG for adding additional insight and research into the field of dividend investing, but I won't be purchasing the QI ETN. Howard Marks' new memo on risk and hedging. Monevator (UK) on the absurd levels of banker pay. Once you've decided to build a dividend-based portfolio, it's essential to know what you're going to do with the income generated by your investments. There are three basic options -- spend the dividend, save it, or reinvest it. Sounds simple, but it's important to establish a strategy for your incoming dividends and make the most of those valuable cash flows. The spending and saving options are fairly straightforward and are primarily used by investors looking to harvest the income from their portfolios to either support their lifestyles or to build up larger cash savings. Reinvesting, on the other hand, is primarily used by investors with a longer time horizon and those who don't need the income now. There are two primary reinvesting methods -- automatic and the what I'll call the manual method. With automatic reinvestment, you instruct your broker to take any dividend received and buy more shares of the same stock that paid you the dividend. Under the manual strategy, you instruct your broker to put all of your dividends into your cash account and when you've saved up enough, you make a larger investment in your favorite idea at the time. There are positives and negatives to both strategies, but before you decide which one you'll use, here are five things to consider. Jack Bogle, the brilliant founder of Vanguard, is famous for his mantra: "Costs matter." The more you pay your broker, the less you keep for yourself and the less money you have available to produce more income. Over time those costs and the lost compounding interest add up, so it's absolutely critical to keep trading costs as low as possible. For each trade you make, a good rule is to keep costs below 1.5% (i.e. if you pay a $10 commission, invest at least $667 at a time), but ideally much lower. Check with your broker to see what type of fees might be associated with their dividend reinvestment scheme. Most US brokers don't charge for automatic reinvesting, but some brokers (particularly overseas, in my experience) may charge a fee for automatically reinvesting your dividends. The size of your portfolio may help decide which option to use. For example, if you have a $20,000 portfolio with a starting yield of 4%, you would expect to generate about $800 in dividends in year one. If your broker charges a $10 trading commission then you'd be able to manually reinvest your dividends once per year and still keep trading commissions below 1.5% ($10/$800 = 1.25%). However, if your broker charges a 1% automatic reinvestment fee you might be better off with that option and keep your cash invested in the market (see key #2) versus sitting in cash earning no interest for the better part of a year. On the other hand, if you have a $100,000 portfolio with a starting yield of 4% and are generating $4,000 a year in dividends, you'd be able to make up to 5 fresh investments of $800 each year and keep costs below 1.5%. Your dividends might only be sitting in cash for a few months and you can be more active with your manual dividend reinvestments. It's important to note that if you have a small portfolio and are regularly adding fresh cash to it, you can consider lumping in dividend cash with fresh cash to make manual reinvestments. This would reduce the "waiting cost" for your cash not earning any interest. One of the benefits of manual reinvesting is that it gives you the opportunity to collect your cash and allocate it toward the most undervalued stock(s) in your portfolio. With automatic reinvestment, on the other hand, the cash is reinvested in the stock that paid the dividend without regard to timing. In my mind, this does not necessarily manual investing a clear winner. I'll expand on this notion in key #4 below, but sticking with valuation for a moment, as long as you are reinvesting in what you consider to be undervalued stocks then either strategy can be beneficial. If you're keeping a good watchlist that includes updated fair value estimates for your stocks, you'll have a better idea if and when your stocks become overvalued. If you're set up to automatically reinvest in an overvalued stock you can instruct your broker simply to not automatically reinvest that period. Instead, lump in the next dividend you receive from that stock with fresh cash added to the portfolio and invest it elsewhere. Once the stock becomes undervalued again, you can instruct your broker to automatically reinvest in that stock again. Of course, the above strategy assumes your broker will allow you to choose a dividend reinvestment strategy on a stock by stock basis. My broker allows this, but others might not. In addition, most brokers in the US will allow you to reinvest in less than one share, but some brokers may not. For example, if the stock trades for $50 per share and the dividend received is $25, some brokers will not allow you to buy 1/2 a share. If this will happen frequently in your portfolio, you may want to consider manual reinvestments and lump in dividends received with fresh cash added to the portfolio. If your current broker's dividend reinvestment options are limited, see if another brokerage firm has more flexible reinvestment options. As long as the other broker's costs and services are similar, it might be time to switch brokers. This is perhaps the most important key of them all. Whichever strategy you decide upon, it's important to take into account your level of investing skill and discipline. For instance, how good are you at determining a company's fair value? One of the benefits of automatic reinvesting is that while you may in hindsight have reinvested at overvalued prices you'll also have likely reinvested at undervalued prices and ultimately reinvested at fairly good prices on average. So if you're not keen on running discounted cash flow models or constantly comparing multiples, automatic reinvesting (all else equal) may be the better option as you'll invest a little in all of your stocks over time and reduce your risk of misallocating funds. Conversely, if you choose manual reinvesting and don't have a good sense for valuation, you may end up allocating your cash to the wrong stocks at the wrong time. This can weigh on long-term returns. On the other hand, if you are a skilled investor you can greatly improve your long-term returns by allocating the incoming cash to the best opportunities. Another question to ask yourself is: How disciplined am I? Manual reinvesting requires you to pay at least a moderate amount of attention to your portfolio and requires good record keeping (see #5); however, an investor who chooses automatic reinvesting could conceivably walk away from their portfolio for years (something I don't recommend) and will have had their dividends reinvested. Automatic reinvestment is akin to dollar-cost-averaging -- a strategy in which the investor invests a little money at a time on a regular basis into the same stock regardless of current market price. Indeed, dollar cost averaging is a strategy Benjamin Graham (somewhat) advocated in 1962: "Such a policy will pay off ultimately, regardless of when it is begun, provided that it is adhered to conscientiously and courageously under all intervening conditions." By setting up automatic reinvestment, your dividends can be put to work without requiring you to make an explicit buy or sell decision. Trouble is we're often derailed from such a strategy by emotions (i.e. stop investing when the market falls, etc.) and lack of discipline. Even if you choose automatic reinvestment, a level of discipline is required though it's more of a passive hands-off discipline. Be honest with yourself. If you don't have the time, discipline, or skill required for manual reinvesting it's probably best to stick with automatic reinvesting -- again assuming all else is equal (costs, broker rules, etc.). Over time, all those little dividend payments and reinvestments add up and can become a bookkeeping nightmare. Whichever reinvestment method you choose, it's essential to keep good and updated records -- for both investing and tax matters. Keep and maintain a spreadsheet that tracks the income you receive from each stock as well as the prices paid for the stocks you bought via reinvestment. Every so often review your strategy and performance. There's no perfect reinvesting strategy for all investors. Instead, consider which one is right for you given these five factors and go forth confidently. When I worked in London, the office was just a few blocks away from the incredible British Museum. Working nearby afforded the opportunity to wander over during my lunch breaks and room by room soak up as much learning as I could. It was paradise for a history junkie like me. You can't help but appreciate as you stroll through the museum that the people who lived thousands of years ago were just as intelligent, insightful, and creative as we are today. Less educated perhaps, but just as bright. What these cultures discovered, created, and built without modern tools is indeed awe-inspiring. This understanding -- that everything is in flux -- has been ingrained in the human mind for thousands of years. Why, then, do we as investors all too often forget or dismiss this understanding -- choosing instead to extrapolate recent events into the future, thinking that what is now forever shall be? If you remember the market sentiment in early 2009, for example, you'll recall how pessimistic everything felt. It seemed like every feature in financial media had something to do with how things could stay bad or even get worse. The perma-bears were cashing in with the "I told you so's" and contending that this time things are, in fact, different. Any bulls that actually made it on air were quickly ridiculed. To be fair to the perma-bears, the opposite happened in 2007 -- the Dow 36,000 crowd dominated the airwaves, declaring the end of business cycles and such nonsense. It's precisely in these type of moments of market madness that investors can stand to profit if they listen to the underlying sentiment. Indeed, as Howard Marks notes in The Most Important Thing, "The psychology of the investing herd moves in a regular, pendulum-like pattern -- from optimism to pessimism; from credulousness to skepticism; from fear of missing opportunity to fear of losing money; and thus from eagerness to buy and urgency to sell." The key is to be aware of these cycles as they happen and be skeptical of investor emotions -- both overly negative or positive -- and invest accordingly. Falling in with the herd's prevailing emotion will inevitably lead to mediocre or sub-par returns, so keep your eyes and ears open for any commentaries that predict the current situation will continue indefinitely and heed Templeton's sage advice that "The four most expensive words in investing are 'This time it's different'". If you hear enough people agreeing that this time is different, that's your cue to do the opposite. As I often say in this blog, patience is the individual investor's greatest advantage over the market. Unlike most institutional investors, nothing is forcing you to invest when the market is riding high, nor keeping you from investing when the market is down in the dumps. You are in an ideal position to profit from Mr. Market's mood swings if you're able to keep your nerve and be a contrarian when he switches from despondent to euphoric and back again. When Warren Buffett says of an investor's commentaries, "When I see memos from (him) in my mail, they're the first thing I open and read. I always learn something, and that goes double for his book," that's a pretty good sign that you could learn something from the investor, too. Buffett is referring to Howard Marks, the chairman of Oaktree Capital, who writes regular investing commentaries on the Oaktree website (click here) and is the author of The Most Important Thing: Uncommon Sense for the Thoughtful Investor (2011). I've been a regular reader of Marks' commentaries for a few years, but somehow - regrettably - only picked up his excellent book this past week. If you're passionate about investing, it's a must-read. Having a watchlist of potential investments next to your workstation allows you to more effectively seize upon opportunities presented by the sometimes-mercurial Mr. Market. Armed with a watchlist, the patient investor will be at an advantage as he or she can simply wait for good investments to arise rather than going out looking for them. But there's a difference between a good watchlist and one that you've scratched on the back of an old grocery shopping list (something I've been guilty of now and again) or keep locked up in your mind where it's sure to be forgotten or warped to fit your sentiment du jour. Fortunately, Marks provides us with the key criteria of a good watchlist -- namely a fair value estimate, a measure for margin-of-safety, and a risk assessment of each investment. Trouble is, determining the intrinsic value for a stock can not only be a complex process, but it can also be very time-consuming. For individual investors that struggle to find time to research stocks between jobs, family time, and other pursuits, intrinsic value estimation can seem a futile endeavor. I reckon that's why many investors rely on rules-of-thumb (i.e. "buy only low P/E stocks") or tips heard from friends or in financial media when making investment decisions. It's a natural response to look for quick fixes when we're short on time, but if we hope to achieve superior investment results, it's essential that we find a way to consistently purchase securities below their fair value and -- perhaps more importantly -- to avoid investing in overvalued securities. While investing contains many uncertainties, we do have one objective piece of information to rely on -- the stock price. The stock price gives us an incredible amount of information about the market's active assumptions for a given security. 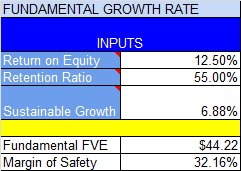 If we make the fair assumption that the intrinsic value of a security is the discounted value of its future dividend payments (Gordon Growth Model), know the latest annual dividend payment, and can make a reasonable discount rate estimate, we can determine the market's current growth assumptions for the dividend. In this case, the market's implied long-term dividend growth rate at $100 is 8.33%. That's powerful insight to have as an investor. By estimating the market's implied growth rate, we can then determine whether or not the market's growth assumption is reasonable (therefore making the stock nearly-fairly valued), too high (overvalued), or too low (undervalued). This leads us to yet another problem, though -- how do we know if the implied growth rate is reasonable, too high, or too low? That is the million-dollar question, of course. If it was an easy answer and everyone knew it, the stock would be perfectly priced because everyone would have the same assumption. Frankly, most of the time the market's estimate is fairly good, which leaves few opportunities to take advantage of mispricings. However, it's still worth determining your own growth estimate because every so often the market graces us with good buying and selling opportunities -- Mr. Market can quickly become a distressed seller offering fire-sale prices or can be euphoric and ready to offer you top-dollar for your stock. In those situations, the emotional Mr. Market pays little attention to reasonable growth estimates and is just looking to make a deal. And that's when the prudent investor should be ready to pounce. What this formula tells us is that if a company is generating a return on equity of 15% and is paying out 50% of its earnings in dividends, the 50% of its earnings that it's retaining can be reinvested in the business at 15%. The sustainable growth rate is therefore 15%*50% = 7.5%. This is the highest growth rate the company can generate without increasing leverage (increased leverage would, all else equal, increase ROE). If we plug this 7.5% growth assumption into the previous example where the $100 market price was implying an 8.33% growth rate, it's possible that the stock is overvalued as the market could be overestimating the company's future growth. At the very least, it opens up some valuable questions to be answered with further research such as "Why might the market be pricing in higher growth -- is it a function of a higher potential return on equity, a higher retention ratio, or a combination of both?" Circling back to the point of these formula explanations, a simple DDM and SGR calculation can be effectively used in a watchlist of ideas by helping you determine a stock's intrinsic value. To get you started, I've created an example watchlist on Google Docs, which you can download (free, of course) by clicking here. The "DDM Valuation" tab contains a DDM tool that can help you determine the implied dividend growth rate of a stock at various market prices. You only need to enter a few data points -- the current stock price, the trailing twelve month dividend payout, and an estimated cost of equity (for most large, stable companies a 10.5% cost of equity is a fair baseline assumption). 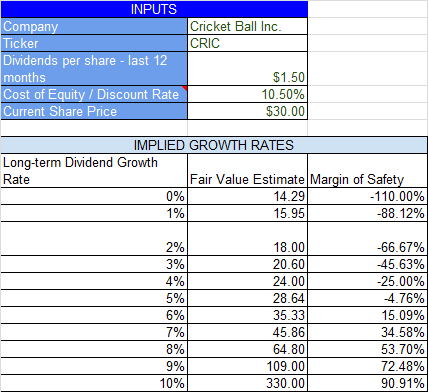 In the default example, the $30 per share market price of Cricket Ball Inc. implies the market is pricing-in a long-term dividend growth rate near 5% assuming a 10.5% discount rate and given its $1.50 per share dividend last year. If Cricket Ball Inc. could grow its dividend at 6%, it might be worth $35 and at 7%, $46, and so on. There's also a simple sustainable growth rate calculator on the "DDM Valuation" tab, which could help you determine a reasonable growth rate assumption for the stock you're researching. You'll need to input the 5 year average return on equity and the retention ratio. In the default example, Cricket Ball Inc.'s five year average ROE was 12.5% and it retained 55% of its earnings last year, which results in a sustainable growth rate of 6.88%. If Cricket Ball Inc. can indeed sustain a 6.88% growth rate, its fair value should be approximately $44 -- again assuming a 10.5% cost of equity -- and that would provide a 32% margin of safety at current prices near $30, making it a reasonable buying opportunity. By no means is the DDM a perfect valuation model (it works best with stable companies with a history of dividend payouts) and the "garbage in, garbage out" rule applies as with any calculation, so be sure to double-check your data points for accuracy. I encourage you to combine the DDM results with other valuation methods to determine a range of possible values. The DDM can, however, provide some valuable insight into the market's current growth estimates and is a fairly simple way to get started with determining a stock's intrinsic value. At the very least, it's better than making buy/sell decisions with no grasp of intrinsic value, which would ultimately lead to poor investment decisions and subpar results. I hope this discussion and sample watchlist will help you make better investment decisions. And do yourself a favor and buy Howard Marks' book! Let me know what you think of it. The market downturn this past week -- indeed, over the past month -- has reignited my interest in buying stocks, and particularly dividend payers. Stocks were in general looking a bit expensive earlier in 2012 and I struggled to find many good opportunities. Frankly, I was getting a bit bored with the market and simply let my dividends roll in. Now, however, I see a number of stalwarts with strong cash flows and solid balance sheets yielding 4-5% (which, in the US is quite high) likely trading with suitable margins-of-safety and I can't help but get interested in buying up some undervalued names. By no means am I going "all-in" here as some of the reasons for the downturn are justified -- Europe could remain a thorn in the side of the global economy for a number of years and the horrible U.S. jobs figure on Friday may have indicated a stalled U.S. recovery. Going into what will be a heated presidential election in November (and don't forget the debt ceiling debate comes up again in September), I don't have high hopes for the market the rest of this year. That said, if you have a long (10+ year) time horizon and can handle a little volatility in equities, that could make 2012 a great time to go hunting for dividend stocks -- building patiently, deliberately, and strategically, of course. Most free online screening tools will allow you to employ these metrics in your search. I should stress that it's important to consider these metrics over a number of years and not just in 2011 or 2012 as some companies -- particularly cyclical companies -- could have had near-peak metrics recently. Again, you want to find companies that have consistently delivered strong results and can deliver sustainable results going forward. We may face some more market volatility in 2012, but it's absolutely essential to remain patient and focused on our own objectives in the face of this volatility. Hang in there, investors. A short post this week -- I plan to have something more substantive next week. A happy Jubilee weekend to my U.K. readers!